Aww, it's Friday! I have been super busy over the holidays, and so I missed last week's challenge over @ Sketch Frenzy Friday, among other challenges. Unfortunetely, I couldn't find time to craft. I am this week's 'creator' of the sketch for the sketch challenge over @ SFF. I hope you like this sketch. I wanted to give you something different and something fun! Enjoy! I used all Stampin' Up! products to create this card. I am sharing a sneak peak of some new products that will be available next month. I started with crumb cake card stock as the card base. The first layer is Pink Pirouette card stock. I added a pieced of Tea for Two DSP for the main panel. I added a 'new' paper doily. (I have to admit, I just LOVE these new products!) The square piece is very vanilla card stock matted with pink pirouette card stock. The stamp is available during Sale-A-Bration next month as well, in a set called Vintage Verses. The stamp is done is basic black classic ink. The paper flower and 'LOVE' ticket are available in the Artisan Embellishment kit. I used a retired punch to create the leaves. I used whisper white craft ink to distress the edges of the leaves. I wanted to add some pearls, so I took my liquid white glue and made a thin line to create a curve, and applied the pearls. I tied some pink pirouette taffeta ribbon around the bottom third of the card. And viola! I hope that you get an opportunity to play along with us this week. The new year will be celebrated in a few days, so please carve out a bit of time to play along with us @ SFF. When I saw the new catalog, I immediately thought of you! Can't wait to see all your creations! 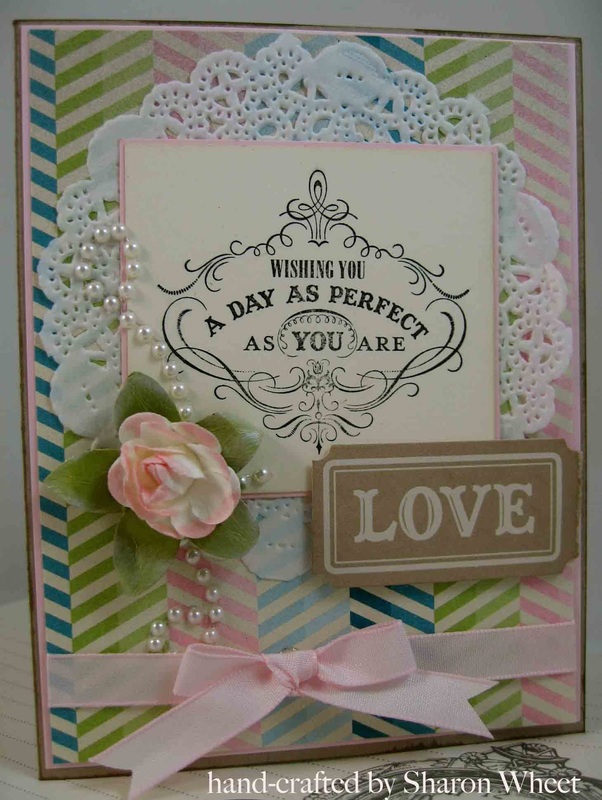 :-) This is a beautiful card--love the pearl accent! Wow!! This is truly wonderful! You are SO creative!! I always love to see what you create! Great sketch this week, too!! WOW! I knew you would love all the new goodies in the new catalog. This card proves it! I want to be just like you when I grow up lolol. You inspire me to create!